Baking a plum cake for Christmas has always been on my wish list for a long time. Not that I never bake, when I used to be in college, it was an everyday affair to keep baking something or the other. But baking an eggless plum cake was out of question. I always thought a fruit cake needs those eggs to make it done or even rich. Well with little learning on the subject and being part of a community that shares so much, I have finally baked an eggless Fruit cake that I could eat. It happens every year and this year too it was no different. I always end up reading on so many plum cakes and other Christmas goodies, but never ever make them. But this year I was determined. 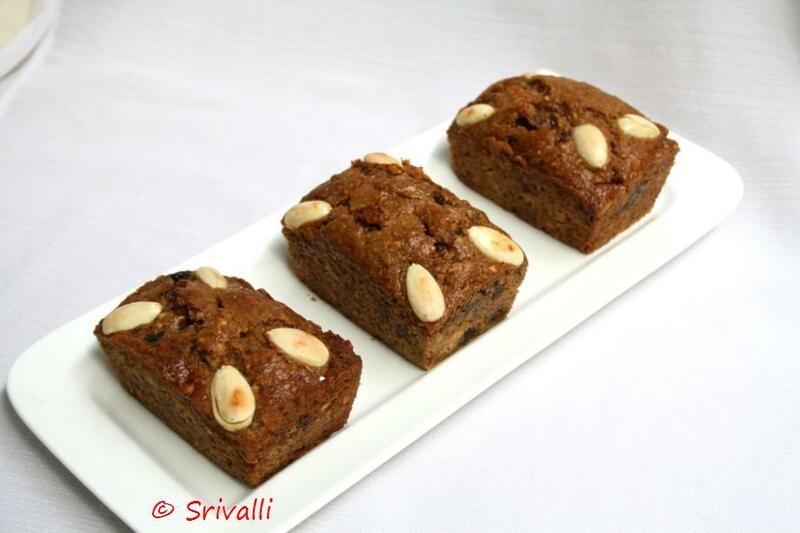 Many bloggers had started talking about fruit cake and I would be seen asking them if they know an eggless version. 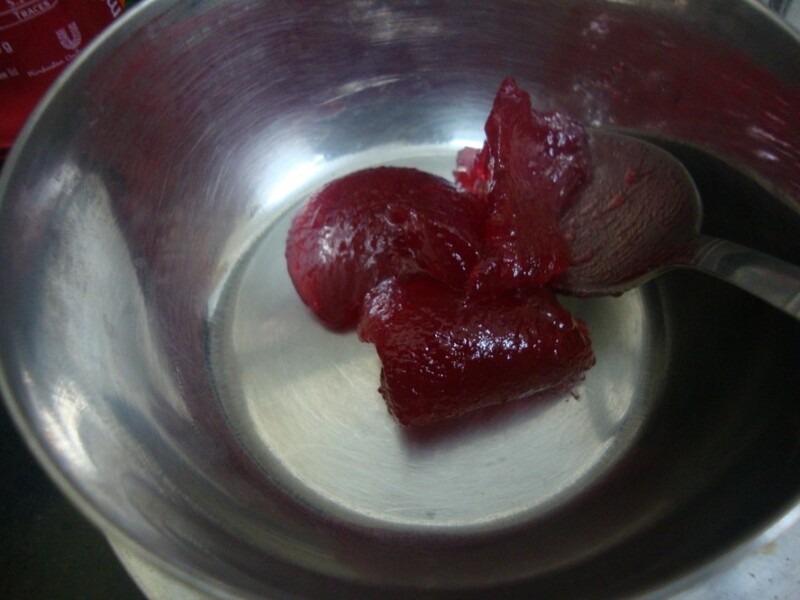 So much so that I think I bugged many of them for an eggless Plum cake recipe. After reading at length on how one can replace the usage of eggs, I even bookmarked quite a few fruit cakes. Hearing so much about the much raved recipe from Raaga, I soaked the fruits and nuts in rum, hoping to get this one done. Yes it is still soaking. 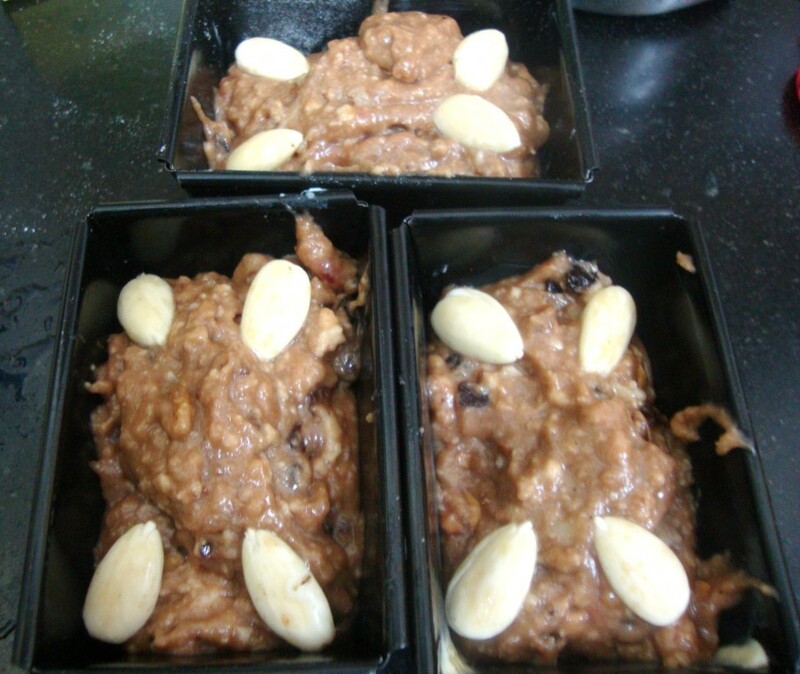 Meanwhile I was pointed to Anushruti’s lovely eggless fruit cakes. I was so touched and inspired that I kept reading on. It was past 12 am and I would have seriously ventured into making it if not for Athamma, who woke up just then. She was disturbed with the rattling I was making to get things ready. I couldn’t sleep much and woke up early again and the first thing I did was to bake this cake. It came out so beautiful and I was impatient to taste it. But I had to rest it for some hours and got back tasting it finally in the evening. Everybody simply loved it. This is surely a keeper recipe. The measurement given below is only halve of the original recipe. I didn’t have maple syrup/dates syrup, so used Mixed fruit jam. If noticed I mentioned version 1, yes version 2 is also ready. You can only imagine the joy I had baking another version. For a cake deprived person this is surely stepping into heaven! I was able to take all the steps while couldn’t for the second one. 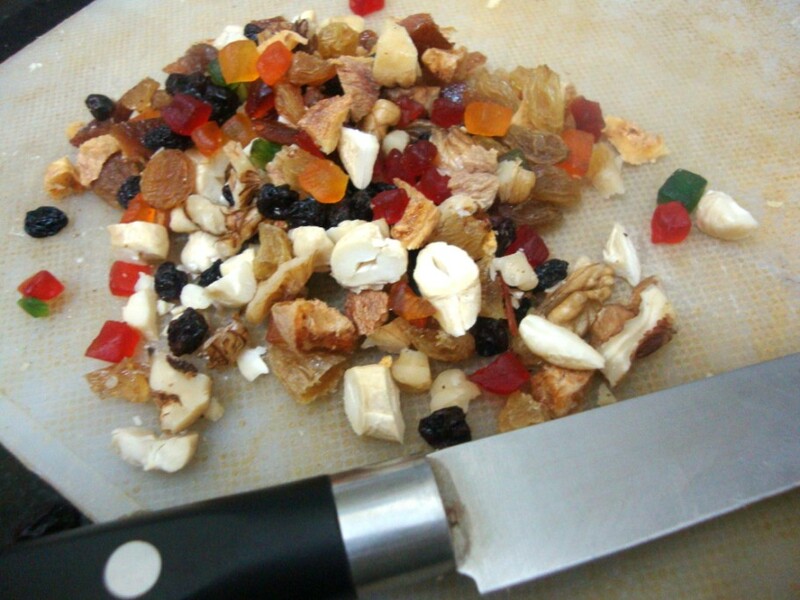 Chop all the dry fruits and buts that you are doing to use. 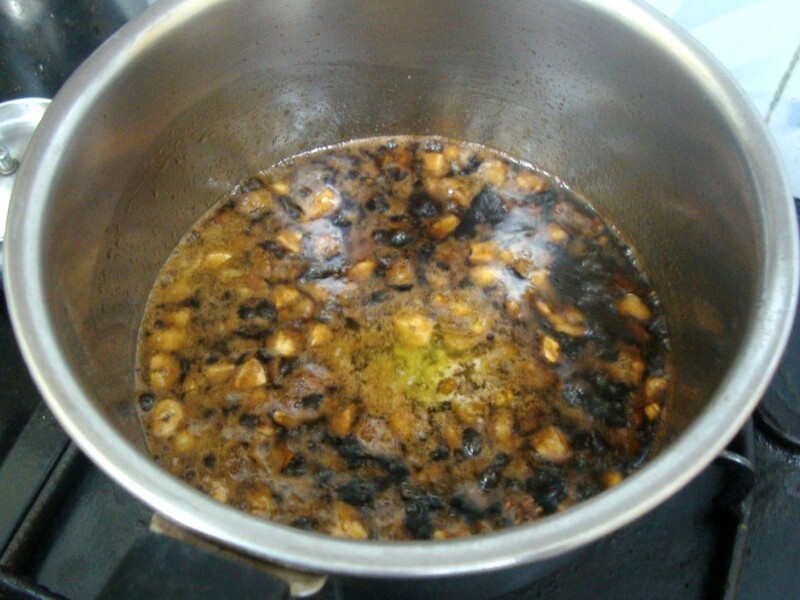 Melt demerara sugar and then add the dry fruits, cook till done. Mix potatoes, baking powder, baking soda to the flour. Combine everything well. Then mix the sugar fruit mix to the flour. Add 2 tsps of Mixed fruit Jam finally. Pour this mix into greased baking tins. more to make it liquid. Once the syrup is cooled, add the soda. Pressure Cook the potatoes and mash after removing the skin. I microwave it as usual but I think pressure cooking it makes more soft and has water content. Keep this aside. Shift the flour along with the baking powder, soda and spice powder. In a bowl, take the flour and add the mashed potatoes. Mix well. Then add the yogurt, whisk well. Next add the fruit mix and combine everything together. If it is not in dropping consistency, add some milk as required. Pour into the greased tins and bake at 185 degrees C for 15 mins. Check at 11th minute for doneness by inserting a toothpick or sharp knife. If it comes out clean, it means done. It gets done by 14th minute. 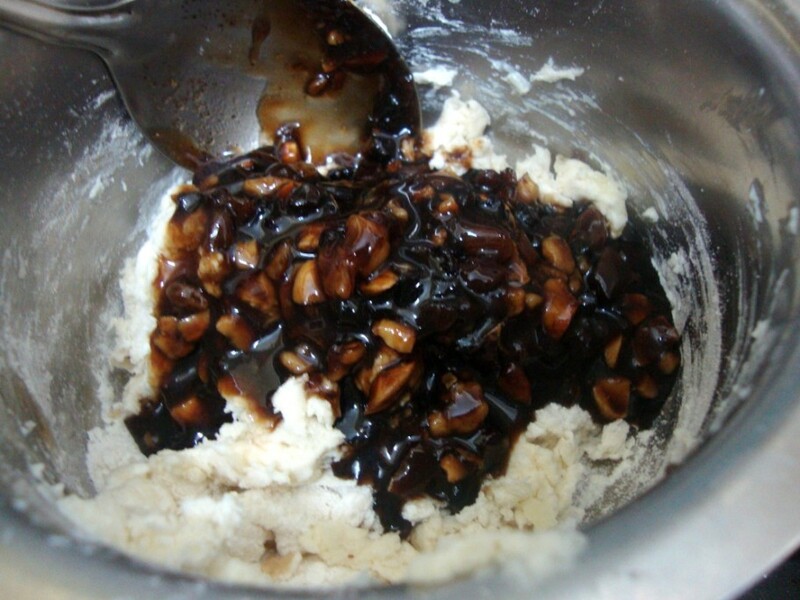 if you want your cake to be little more brown, bake for couple of minutes but keep an eye and not let it burnt. *For making the Spice powder (Clove, Cinnamon, Nutmeg). roast the spices separately and grind them in those small mixer jars. 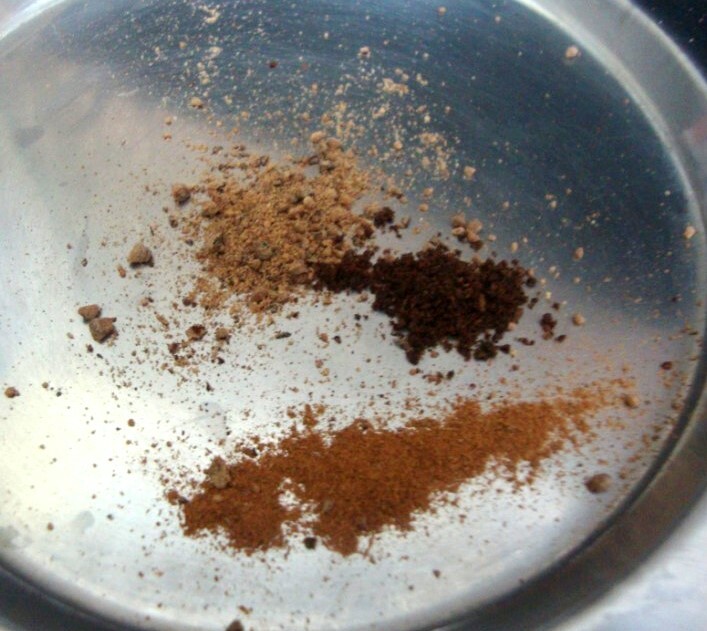 Since I had Cinnamon and Nutmeg, I had to grind only cloves. The first batch got over within minutes and I made another one very soon. It was fun enjoying the holidays with these fruit cakes, though my kids didn’t eat as they don’t eat fruits in cakes. They wanted those chocolate muffins again. 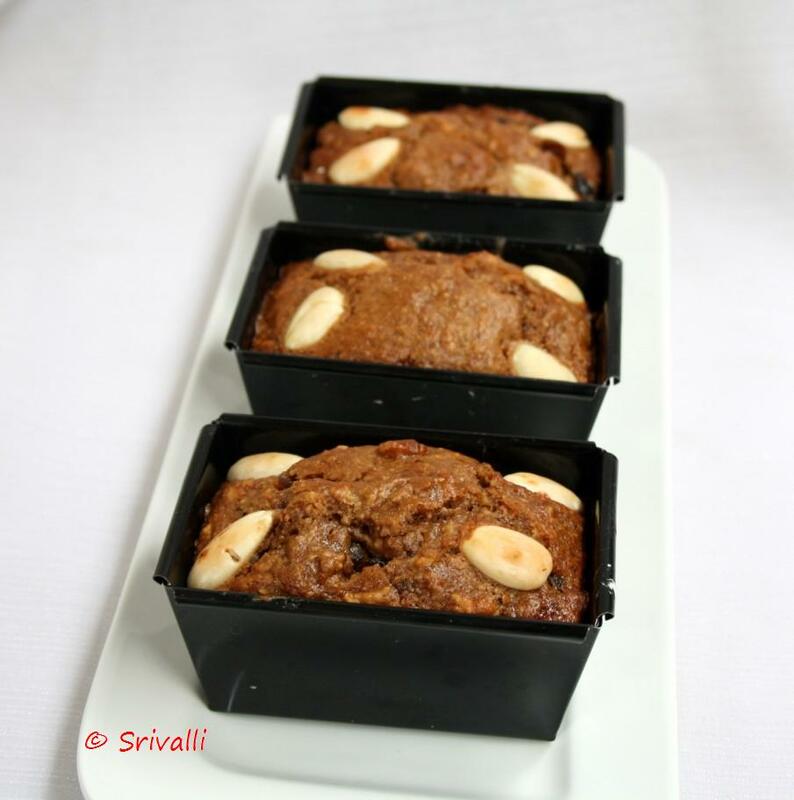 Do try these if you want to enjoy eggless fruit cakes. yummy ! potatoes for the cake batter keeps me hooked ! 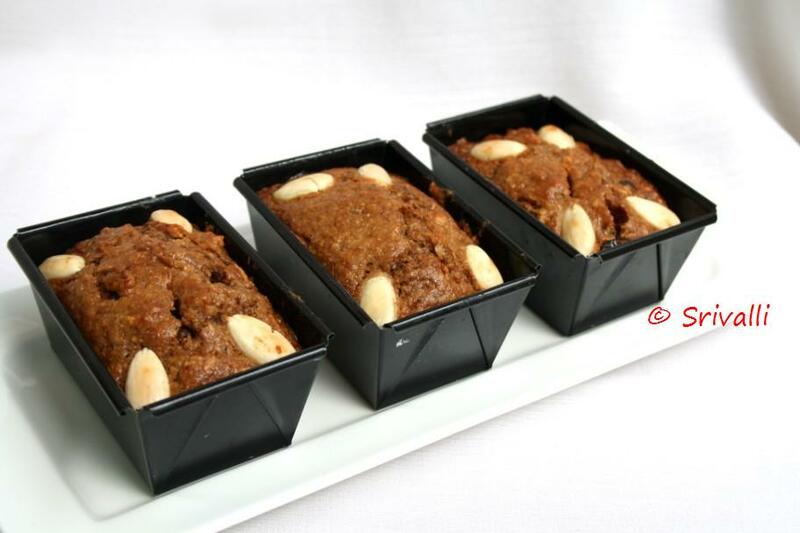 Egg less Fruit Cake looks so delicious and simple to prepare. thanks for showing step by step recipe. 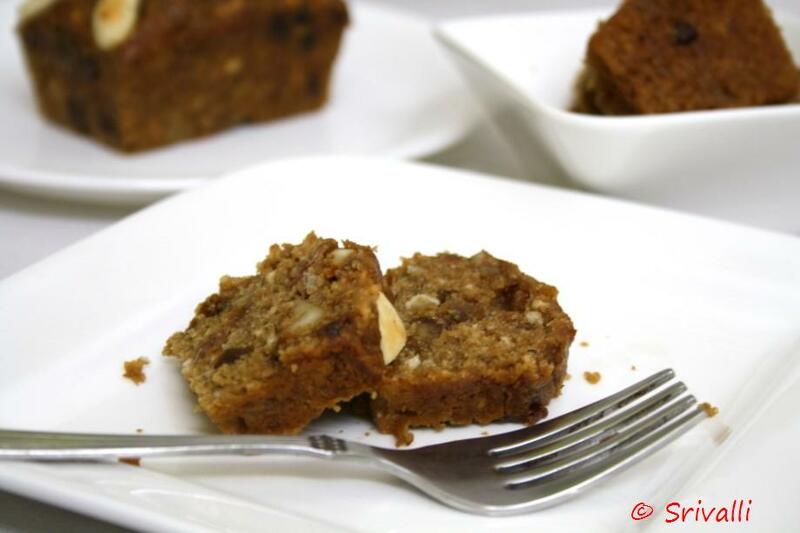 yes indeed..potatoes in cake is something new to me though I have seen cakes with sweet potatoes..this is in my to do list now..good one..
Omg, potatoes in cake:othats really new for me..fruit cakes looks excellent and cute..
eggless fruit cake looks delicious…. 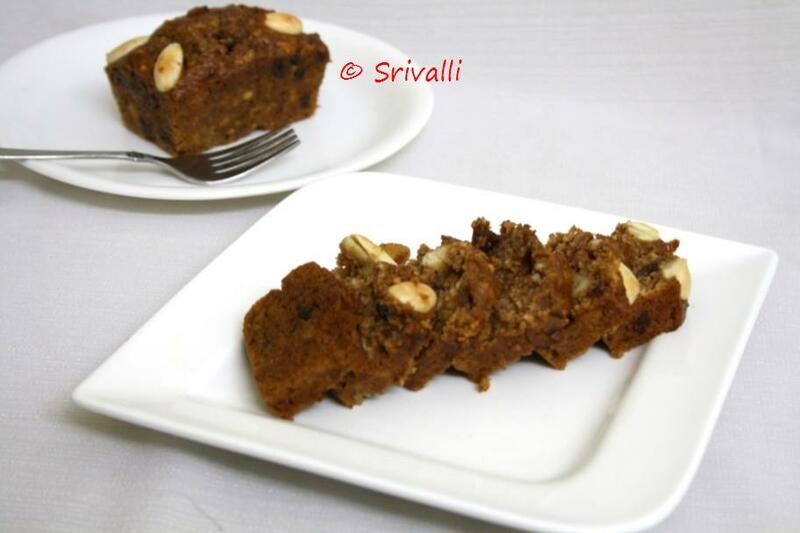 Wowwwwww.. Amazing and delicious recipe.. looks simply awesome.. lovely step by step photos ! !